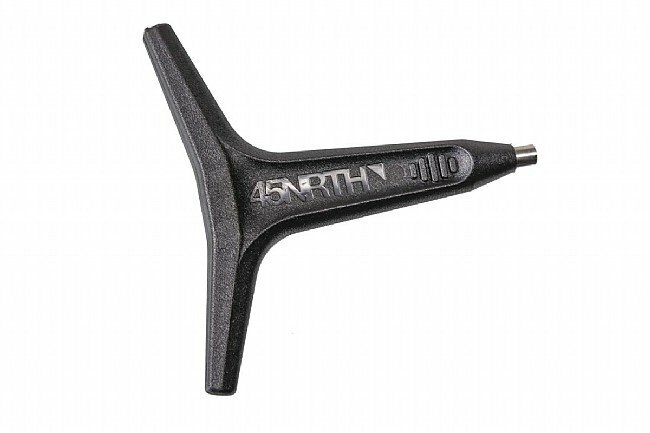 The 45Nrth Stud Insertion Wrench makes short work of installing their aftermarket studs by providing a secure hold on the tips of the studs while being inserted into the stud holes on 45Nrth tires. An ergonomic Y-shaped hand hold allows for a grip that remains comfortable over the course of completing a pair of tires. Makes stud replacement a breeze. This tool makes replacing missing studs a very easy and quick job. Worth buying if you do enough riding. I used this along with the aluminum-carbide studs to add some traction to my Wolfgars. For this purpose, this tool (or something identical) is pretty essential - you really have to wrestle those studs into place. Maybe a needle nose pliers would work but I have a feeling it'd slip. Oh well. The handle is comfortable and it worked perfectly. I took off one star for value since it's such a unitasker. BTD delivered quickly as always. I am sure this TIRE stud tool is great, but this item was suggested to me with my 45Nrth pedals, so, I assumed this was the tool I needed to customize pedal studs. Wrong! It's JUST for tires...I felt a little silly, but FYI, don't make my mistake! Would love to know if there is a toolway to customize pedal studs if anyone knows. it works well, only thing that could improve it would be some magnetization so that the studs don't fall off the wrench. studded tire are expensive, so being able to replace worn studs prolongs the life of the tire.